Regenerative urban agriculture is like a lab that fosters the development of a multitude of knowledge sets, not only in the field of sciences and technologies for sustainability, but also in environmental education for ecosystems and biodiversity conservation. The destruction of Cerrado (Brazilian Savannah), the second largest biome in Brazil after Amazonia, has become the main concern of urban collectives focused on reintroducing elements of this important ecosystem in city landscapes and in the imaginations of city dwellers. In this essay, we look at urban farming for Cerradoregeneration from the perspective of cultural historical activity theory (CHAT) (Engeström, 2001, 2015), that provides a systemic and prospective approach to human practices, particularly useful to foster collaborative learning processes by collectively identifying and handling evolving tensions and contradictions and building consensus on goals, principles and procedures. In Brazil, the conversion of native habitats to large scale-farming has caused, among other environmental impacts, deforestation and fragmentation of natural systems along with a considerable loss in biodiversity (Klink and Machado, 2005; Pearce, 2011; Schiesari et al., 2013). If, on the one hand, the rate of deforestation of Amazonia has declined since 2005, thanks to control programs sponsored by the Brazilian government—then on the other hand, efforts so far are insufficient to restrain the destruction of Cerrado. On the list of the world’s 35 hotspots, it is estimated that in just 20 years, the area ofCerradohas been reduced by 26 million hectares or 260,000 km2, equivalent to twice the area of England. Today Cerrado’snative vegetation occupies 47 percent of its original area and the area preserved by conservation units only corresponds to 6.6 – 8 percent, if we consider reserves which afford higher levels of protection (Beuchle et al., 2015). Urbanization is one of the factors responsible for the destruction of the Cerradobiome. Cities account for only 0.25% of the total area of the country (Miranda et al., 2005), thus they have a smaller direct impact on natural landscapes compared to agriculture, but the urban population in Brazil is expected to reach 90% of the total population by 2030. Such increasing concentration will exert a great deal of pressure on natural habitats, if not in terms of space (Bogaert et al., 2014) surely in ecological footprint (Rees, 1996). It is true that natural environments are protected under Brazilian law, but recently laws have been loosened by federal and local administrations in order to meet the demands of urban developers. Remnants of this strikingly beautiful wooded grassland have been pushed to the fringes of urban spaces and designated as empty space that has been abandoned or used for dumping garbage. Stigmatized as inhospitable and inhabitable areas, most Brazilian cities now see the Cerradoas no more than vacant land, reserved for urban housing, road networks of industrial buildings sprawling from the city, both formally and informally. There is little consideration for how the original landscape will be changed irreversibly, with effects on soil fertility and productivity, local and global climates (e.g. urban heat islands and emission of greenhouse gases), water resources, and finally habitat and biodiversity (Tratalos et al., 2007). Given the prospect of extinction of one of the richest biomes on the planet and the consequences this would have on the quality of human life and wildlife, local and international NGOs and research institutions, among other actors, have been undertaking initiatives aimed at Cerrado conservation and regeneration. With access to very diverse resources and tools, they compose a heterogeneous and comprehensive movement with different motivations, specific contents and local expressions. The production of seedlings and the cultivation of arboreal native species for commercial purposes is one of these initiatives. The seedlings grown in commercial nurseries are intended for reforestation of “legal reserve areas”—although in most nurseries where Cerrado plants are reproduced, shrub and herbaceous flora (which in natural settings tend to predominate over the trees) areoften neglected. Indigenous people, who have a deep understanding of Cerrado’s ecology have been an important part of this movement. They have cultivated and lived in tune with the region’s biodiversity since time immemorial. It remains an essential resource for subsistence, and is a knowledge set that is mobilized through practice and handed down from generation to generation. In fact, Brazil is a country whose socio-ecological traits and dynamics reflect its great biocultural diversity and in which societies driven by globalized leading technologies coexist (sometimes side by side, as in the case of the metropolis of São Paulo), though not necessarily peacefully, with societies whose existence is inextricably linked to the features and resources of local landscapes and indigenous practices, knowledge and skills developed in the management of soils and biodiversity of fields and forests (Posey, 1985; Hecht, 2009). In this essay, urban farming and ecological restoration are considered as intermingled practices aimed precisely at creating a culture which promotes biodiversity by arousing sensitivities and attitudes of care and belonging to a community which comprehend all living beings and the landscape we shape together (Kudryavtsev et al., 2012; Tidball and Krasny, 2010; McCann, 2011; Krasny et al., 2013). Ecological restoration focuses mainly on revitalizing natural ecosystems, but local perspectives eventually seek to realign it beyond its initial rewilding purposes toward other interests like food and with a focus on growing edible herbs (McCann and Schusler, 2016). Urban agriculture for restoration delves deeper by cultivating resilience and enhancing biological diversity and ecosystem services, such as pollination, soil enrichment and natural weed and pest control. Such a complex and challenging task both demands and generates knowledge and learning. In this way, regenerative urban agriculture is like a lab that fosters the development of a multitude of knowledge sets, not only in the field of sciences and technologies for sustainability, but also in environmental education for ecosystems and biodiversity conservation. It embodies the idea of community of practice, as participants—volunteers and collaborators (technicians, scientists etc.) learn by doing and interacting, and through the collaborative mobilization of information and resources to overcome problems and contradictions inherent to the activity. Of all the organizations for Cerrado conservation mapped in 2017 by the Institute for Population and Nature Society (ISPN) in partnership with Conservation International (CI), few of them have been focused on cultivating seedlings of native species for the recovery of degraded areas in rural environments, and none of them operate in urban settings. However, the ISPN report doesn’t do justice to a more recent phenomenon that acquired some visibility thanks to social networks involved in interventions to repopulate urban public areas with native vegetation from Cerrado. Individuals and groups engaged in this activity are not numerous, but strongly motivated, as their performance is characterized by tenacity in the face of all sorts of constrains. After all, public space, especially on the periphery of capitalism, is characterized as a place of conflict among contradictory interests, uses and practices (Wisnik, 2018). In one way, the activities of these urban groups acts as a counter movement and is a protest in and of itself in its resistance against the predominant model of urbanization—which is heavily predatory of local biodiversity and natural resources. Their conception of green areas design goes beyond arbitrary aesthetics—which do not contemplate the ecological and ornamental value of native species—and recognizes the propaedeutic importance of utilizing Cerrado vegetation as a prerequisite for its conservation (Siqueira, 2016). In the book Guia de campo dos Campos de Piratininga(Field guide to Piratininga Fields)—where Piratininga Fields used to be the “landscape prior to colonization, having been extinguished after São Paulo urban development” (2016, p. 13)—visual artist Daniel Caballero describes a collective experience of recomposing a Cerrado landscape in a public square in São Paulo, by “looking for wild landscapes in the ditch and collecting memories of a discarded and residual nature, of no value” (p.31), in order to compose a “collage of varied territories represented by plants and the harvested soil itself … as a practice of subversive relational art, mobilizing people with the intention of creating a decolonizing territory within the city” (p.61). Another active group in Cerrado restoration (in the city of Brasília) is headed by landscape architect Mariana Siqueira. Her office develops projects and experiences in partnership with the Chico Mendes Institute for Biodiversity Conservation (ICMBio / MMA) and the University of Brasilia (UnB), whose researchers subsidize through technical knowledge the creation of a conceptual and methodological framework for “a landscape that expresses the Brazilian savannah”. The purpose of this collective is to bridge the gap in the theory, teaching and practice of landscape architecture by utilizing Cerrados pecies in gardens aimed at reconnecting users to territory from an affective point of view and recreating habitat for wildlife. Finally, the collective Pomar do Cerrado (Cerrado Orchard) was created as a branch of a movement for the conservation of a natural area within the campus of the Federal University of São Carlos (SP) threatened by the ruling master plan, which has transformed the previous landscape into a predictable mosaic of buildings, parking lots and vast lawns. The immediate purpose of the orchard’s mentors was to make beauty and worthiness of native species apparent to local people, especially the academic community. But the deeper motivation of their activity consisted in reintroducing Brazilian Savannah into collective consciousness through a process of ecological place meaning (Russ et al., 2015), and ultimately in persuading the institution to develop an effective nature conservation program. The three collectives above are born from the passion and obstinateness of their founders. Over time, actors and collaborators joined the activity oriented toward a common object—which consists in keeping the Cerrado alive in both, urban physical and mental landscapes—with enough drawing power and motivational force to stimulate the search for sustainability and expansion in spite of a number of adversities and constraints, such as little monetary rewards or institutional support and excessive expenditures of time and energy. Engeström (2009) conceptualizes these social production activities as wildfire activities, since they follow a pattern of development characterized by expansive swarming, sideways transitions and boundary-crossing. Wildfire activities are also characterized by high mobility. One of the main actions of participants is “plant hunting”, which entails walking through the city or preserved natural areas to collect specimens, fruits and seeds. But the physical movement of the actors is just one dimension of mobility, since both the material terrain where the garden or orchard is located and the virtual terrain of the activity are continually intersected by the entanglement of information and other things . As Pink (2012) puts it, although the garden asa materiality is visible as a locality, the garden project is not a bounded entity, its edge being opened to plants, humans and other living beings, services (i.e. water), material inputs and tools that move between these virtual borders, as well as are affected by local changes, such as the weather. For example, in the case of Cerrado restoration, gardens and orchards especially are meant to provide awareness and inspiration, experiences of sensory aesthetic, new socialities and nurturing relationships alongside learning opportunities about those gardens in particular and the making of them. In their turn, all these experiencial aspects are constituted in relation to discourses, intentionalities, agencies and agendas which also transcend the garden as a locality, thus emphasizing its character of “a site where agency can be exercised in the face of global culture” (Pink, 2012, p.89). By moving around in an unexplored territory, that is both material and experiential, people make, therefore, cognitive trails which lead to a progressively more stable conceptualization of that territory and of the way of moving in it. Thus, for instance, when walking through a natural or even degraded area of Cerradoin search of fruits and seeds, or just of evidences of its vegetation, that which may appear to the beginner as an indistinct green mass reveals to a more attentive look its diversity of shapes and textures, its seasonality and mutability—this change in perception is well described in the interview with Mariana Siqueira by Cerrado Infinito: “As I learn to know each type of plant, my sight opens to this type of vegetation and I distance myself from the everyday landscape. What used to be a uniform green mass gains countless textures and volumes, as if I were cured of a type of myopia”. Our perception—which corresponds to active engagement with the things that matter to usthrough our sensing and sensed carnal bodies—is a privileged source of awareness and knowledge of the landscape, its elements and transformations. In the sphere of activity which has as its general object the “scratching” of a tract of urban landscape in order to transform it into something that evokes (and invokes) the native landscape, the making of a Cerrado garden or orchard can be understood as a process of sensorial and embodied engagements (collecting and saving seeds, producing seedlings, digging planting holes, gardening and also observing the transformations the garden goes through…) as well as other imaginative and practical actions (planning, applying for funding or support, recruiting volunteers, researching, recording and publicizing the results… ) “designed to change the way that the garden might be experienced/known” (Pink, 2012, p.94). Through this repertoire of actions and operations that configure the routine of the collectives, trails both across the territory and as cognitive objects leave marks in experience and in the environment—a garden, an orchard, a particular scenery, but also their representations, like a book, an electronic catalogue, an exhibition, among other narratives. Particularly the marks in the environment tend to persist and allow the enhancement of the ability to navigate through certain feature-domain (Engeström, 2009) a well as to fit each one’s purpose in the activity. In fact, people gain their membership by virtue of contributing something to the collective, and once engaged in the activity, they work symbiotically, on the basis of a spontaneous, indirect coordination between agents or actions—this is another feature of wildfire activities which also suits the specific practice of planting and cultivating Cerrado in urban settings. Actually, this activity is carried on by heterogeneous and floating collectives composed by agents coming from different cultural backgrounds (academics, artists, landscape architects, environmentalist…) who join the groups drawn by particular interests, but are still involved in the transformation or redefinition of a shared challenging object. “Encounters” (as defined by Engeström are interactions between actors in the effort to construct a temporary yet effectively collaborative knot) also include agents of institutions with vested power, as is the case with the project Cerrado Orchard. At a certain moment of its existence, this collective sought opportunities for dialogue and support from the university which served to ensure continuity and the activities expansion on university grounds and created permanent material infrastructure. Encounters between agents in their various trajectories generate questions, deliberations, negotiations and decisions that reflect a sort of balance between understandings, intentions and valuations that are often contradictory. This non-conflict free process shapes the activity in its organization and dynamics. It affects, for example, the adoption of technologies and tools or the drafting of procedures and rules etc. I have been part of the Cerrado Orchard collective for the past three years. Therefore, the following account is based on my own experience as a volunteer, and informed by my academic background in environmental education. More specifically, my description of the Cerrado Orchard activity is inspired by the principles of CHAT, that is, it brings into focus the activity organization and its change caused by a process of expansive learning throughout which the collective has constructed its own conceptual platform and infrastructure. The collective owes its existence to a ten year dispute over the use of a natural area of 50 Hectares on the campus of the Federal University of São Carlos (UFSCar): where the campus administrators see an undifferentiated piece of land intended to expand infrastructure, the collective—that strives for the preservation of the biotic community which inhabits that fragment of Cerrado—sees a tract of an ecological corridor (whose disruption could cause an irreversible loss of local biodiversity), but also an opportunity of coexistence with other living beings in urban environment. Along such local dispute—which typify the deeper contradiction between conflicting exchange and use values resulting from the commodification of urban land—it became evident that the planning office was neglecting native vegetation and was unwilling and unprepared to incorporate it into the design of green areas on campus. So, in a first moment Cerrado Orchard presents itself as an initiative of guerrilla gardening – which consists of the unauthorized cultivation of native plants on one of the grass surfaces that occupy much of the territory of the university—in protest against invisibility of Cerrado to those responsible for administrating the campus territory and infrastructure. 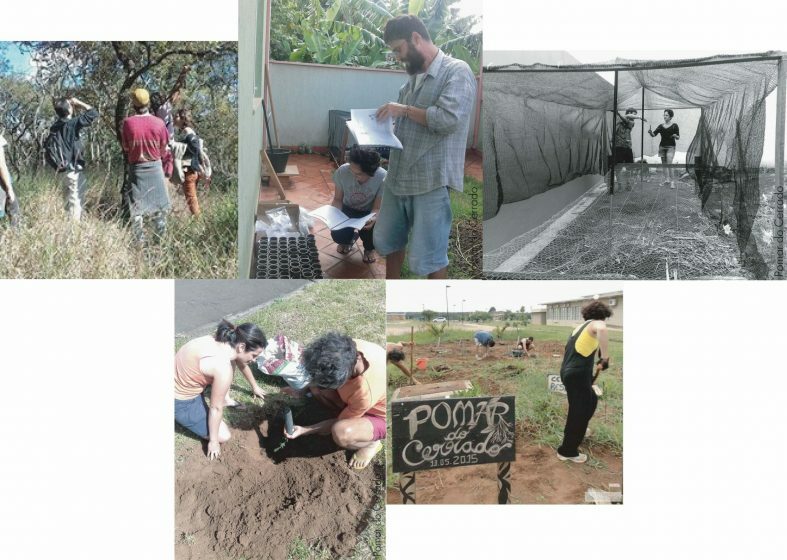 Although still weakly coordinated, the efforts of a collective inexperienced in cultivation practices, which is only dedicated to this activity in their free time, sought to mark a trail aimed at linking the Cerrado fragment threatened by the campus master plan to the daily life of the university community and campus users in general. Participants concentrated on performing basic operations such as preparing the soil, planting seedlings, keeping them alive during the dry season, protecting them from wind and invasive plants. Volunteers engaged in actions related to Cerrado Orchard activity. Volunteers ignored the scientific denomination of most plants, known through fancy names assigned ad hoc to evoke morphological or sensorial characteristics (such as perfume and texture), which made possible to associate the collected seeds to the mother plants in the forest. However, this system of identification limited the search for information, both in botanical collections or scientific publications. The need to ascribe the plants of the orchard to the web of ecological relations they participate in the local context, and to appreciate not only the plants of the orchard itself, but also the habitat they come from, caused the group to start a virtual catalog of the orchard’s species, as well as a database of scientific publications about Cerrado in the territory of the university. Another contradiction identified by the collective stems from the current configuration of the orchard, far below expectations of stimulating the aesthetic fruition of the orchard through its design. To overcome this contradiction, the collective has invested in isolated and amateurish interventions such as the placement of plaques that identify the plants, the creation of paths and supports for climbing plants. However, the design of a garden demands expert skills and knowledge, the learning of which should become a priority in view of the orchard expansion. The most important effect of publicizing the collective’s results in social networks and of seeking a dialog with people which share the same interests was aggregation of collaborators, specialized knowledge, tools and techniques that contributed to improve the object of the activity—consisting in growing the Cerrado in urban landscape as well as the actions needed to materialize it. On the other hand, more recent demands (i.e. a database) drove the collective closer to scientific community. Indeed, the volunteers who created and care for the orchard have been working on a trial and error basis, using their own resources and with restricted access to academic and technical knowledge. This has clearly limited the results of their efforts, both in substantive terms (e.g. orchard’s extent and configuration) and in terms of learning opportunities, which could be provided by research together with hands-on activities. The need to overcome such limitations, related to contradictions between the Cerrado Orchard collective and the academic administration, caused the practice to move along a path of expansive learning and development. As a result, an outreach program was created—The Cerrado Ark: Gardening for Cerrado Valuation and Restoration—through which the collective has sought the collaboration and resources of the academic institution with the purpose of consolidating its own infrastructure and social impact. In a recent article in The New York Times entitled The Global Solution to Extinction, Edward O. Wilson defends that “The only way to save upward of 90 percent of the rest of life is to vastly increase the area of refuges, from their current 15 percent of the land and 3 percent of the sea to half of the land and half of the sea”. According to him, such amount “can be put together from large and small fragments around the world to remain relatively natural, without removing people living there or changing property rights” and he describes our sustained coexistence with the rest of life both a practical challenge and a moral decision. This essay presents aspects related to the structure and development of the activity of urban collectives which took very seriously the challenge launched by Wilson. 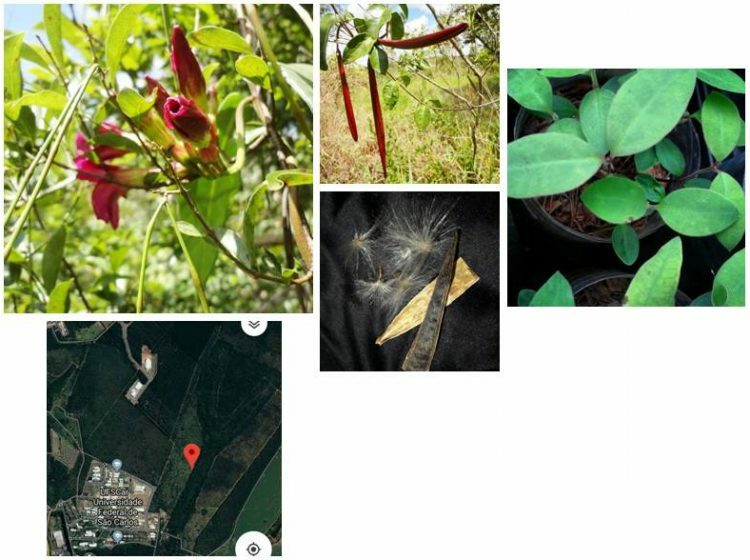 Indeed, they engaged in learning processes aimed at reintroducing Cerrado’s endangered biotic community not only in urban landscapes, but also in the collective imagery, through a process of production and ecological significance of places. This practice, with local variations, has the characteristics of a wildfire activity (Engeström, 2009), a model of human and organizational activity that pursues innovation and expansion along with efficiency and sustainability according to a pattern of development which take multiple learning directions and crosses the boundaries of academic disciplines, fields of knowledge and ways of knowing and learning. Particularly the activity addressed in this article has ecological sustainability as its central object; in a historic context in which government organizations as well as research institutions have shown serious limitations in fostering attitudes and policies needed to reverse the destruction of natural ecosystems, the collectives mentioned in this paper took on the task of criticizing and provoking the transformation of current cultural practices that place at risk not only the survival of wildlife, but the very basis of natural resources on which all human societies depend, regardless of their socioeconomic formations. In the opening of physical and conceptual trails with the purpose of consolidating their own infrastructure, the collectives intersected other historical trails; in fact, as Engeström reminds us, the physical, cultural and symbolic landscape on which the collectives learn to move and leave the marks of their agency, “never is an empty space to begin with; it has dominant trails and boundaries made by others, often with heavy histories and power invested in them. When new dwellers enter the zone, they eventually have critical encounters with existing trails” (p.14). Thus, the Cerrado planters’ journey is unlikely to be free of obstacles and contradictions imposed by dominant cultural practices of urban land use. But precisely the overcoming of these obstacles and contradictions constitutes the main motivation and motor of development and self renewal of wildfire activities, as they trigger processes of transformative learning, whereby participants gain awareness and control on the activity, greater efficiency in the use of resources and opportunities, sustainability and social impact. Beuchle, R., Grecchi, R.C., Shimabukuro, Y.E., Seliger, R., Eva, H.D., Sano, E.andAchard, F.2015. Land cover changes in the Brazilian Cerrado and Caatinga biomes from 1990 to 2010 based on a systematic remote sensing sampling approach. Applied Geography. 58: 116–27. Accessed February 10, 2018. Doi:10.1016/j.apgeog.2015.01.017. Bogaert, J., I. Vranken and M.Andre, 2014. Anthropogenic effects in landscapes: historical context and spatial pattern. In:(Hong Sun-Kee, J. Bogaert and Min Qingwen, eds) Biocultural landscapes: diversity, functions and values. Springer, Dordrecht, pp. 89–112. Bolund, P and S. Hunhammar. 1999. Ecosystem services in urban areas. Ecol Econ. 29: 293–30. Accessed February 10, 2018. Doi:10.1016/S0921–8009(99)00013–0. Dias, J.E. and Laureano, L.C. 2009. Farmacopéia Popular do Cerrado. Goiás: Articulação Pacari (Associação Pacari), Goiás. Engeström, Y. 2001. Expansive learning at work: toward an activity theoretical reconceptualization. Journal of Education and Work. 14: 133–156. Accessed February 10, 2018. Doi:10.1080/13639080020028747. Engeström, Y. 2009. Wildfire activities: new patterns of mobility and learning. International Journal of Mobile and Blended Learning. 1: 1–18. Engeström, Y. 2015. Learning by expanding: an activity-theoretical approach to developmental research. Cambridge University Press, New York. Hecht, S. 2009. Kayapó savanna management: fire, soils, and forest islands in a threatened biome. In: (Woods, W.I., W.G. Teixeira, J. Lehmann, C. Steiner, A.
WinklerPrins and L. Rebellato eds) Amazonian Dark Earths: Wim Sombroek’s vision. Springer, Dordrecht. Klink, C.A. and R.B. Machado. 2005. Conservation of the Brazilian Cerrado. Conservation Biology. 19: 707–713. Accessed February 10, 2018. Doi:10.1111/j.15231739.2005.00702.x. Krasny, M. E., C. Lundholm, E. Lee, S. Shava and H. Kobori. 2013. Urban landscapes as learning arenas for sustainable management of biodiversity and ecosystem services. In: Elmqvist, T., M. Fragkias, J. Goodness, B. Güneralp, P.J. Marcotullio, R.I. McDonald, S. Parnell, M. Sendstad, M. Schewenius, K.C. Seto and C. Wilkinson eds) Urbanization, Biodiversity and Ecosystem Services: Challenges and Opportunities. Springer, New York. Kudryavtsev, A., M.E.Krasny and R.C. Stedman. 2012. The impact of environmental education on sense of place among urban youth. Ecosphere. 3. Doi: 29.10.1890/ES1100318.1. Maroni, B.C, L.C. Di Stasi, S.R. Machado. 2006. Plantas medicinais do Cerrado de Botucatu: Guia ilustrado. Editora UNESP, São Paulo. McCann, E. 2011. Restoration-based education: teach the children well. In: (Egan, D., E.E. Hjerpe and J. Abrams eds.) Human dimensions of ecological restoration: integrating science, nature, and culture. Island Press, Washington, pp. 315–334. McCann, E.P. and T.M. Schusler. 2016. Ecological restoration. In (Russ, A.,M.E.Krasnyeds.) Urban Environmental Education Review. Cornell University Press, Ithaca, N.Y., pp. 251–260. McKinney, M.L. 2002. Urbanization, biodiversity, and conservation: the impacts of urbanization on native species are poorly studied, but educating a highly urbanized human population about these impacts can greatly improve species conservation in all ecosystems. BioScience. 52: 883–890. Accessed February 10. Doi:10.1641/00063568(2002)052[0883:UBAC]2.0.CO;2. Pearce, F. 2011. The Cerrado: Brazil’s other biodiverse region loses ground. Yale Environment 360, Yale School of Forestry and Environmental Studies. Accessed February 10, 2018. http://e360.yale.edu/features/the_cerrado_brazils_other_biodiversity_hotspot_loses_ground. Pink, S. 2012. Situating everyday life: practices and places. Sage Publications Ltd, London. Rees, W. 1996. Revisiting carrying capacity: area-based indicators of sustainability. Population and Environment. 17: 191–215. Accessed February 10, 2018. Doi:10.1007/BF02208489. Russ, A.; S.J. Peters, M.E. Krasny and R.C. Stedman. 2015. Development of ecological place meaning in New York City. The Journal Of Environmental Education. 46: 73–93. Accessed February 10, 2018. Doi:10.1080/00958964.2014.999743. Schiesari, L., A. Waichman, T. Brock, C. Adams and B. Grillitsch. 2013. Pesticide use and biodiversity conservation in the Amazonian agricultural frontier. Philos Trans R Soc Lond B Biol Sci. 368: 1619. Accessed February 10, 2018. DOI: 10.1098/rstb.2012.0378. Standish, R. J., R. J. Hobbs and J. R. Miller. 2013. Improving city life: options for ecological restoration in urban landscapes and how these might influence interactions between people and nature. Landscape Ecology. 28: 1213–1221. Accessed February 10, 2018. Doi:10.1007/s10980–012–9752–1. Tratalos, J., R.A. Fuller, P.H. Warren, R.G. Davies, G. Richard and K.J. Gastonet. 2007. Urban form, biodiversity potential and ecosystem services. Landsc Urban Plan. 83:308– 317. Accessed February 10, 2018. Doi:10.1016/j.landurbplan.2007.05.003. Wisnik, G. 2018. Espaço Público: Para ser ‘público’ de fato, é preciso conflito. Cidades em disputa, Jornal Nexo. Accessed February 10, 2018. https://www.nexojornal.com.br/especial/2018/01/26/Cidades–emdisputa?utm_source=socialbttns. 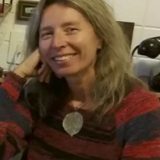 Since 2016, Sandra has been working for the outreach activity A Arca do Cerrado: jardinagem para a valorização e a recuperação do Cerrado (The Cerrado Ark: Gardening for Cerrado Valuation and Restoration), on the UFSCar campus, Brazil. Great project and important to disseminate it.